So I was just passing through Cleveland and I definitely felt the need to stop at the Rock n Roll Hall of Fame to check it out. First of all, the building is incredible. What a cool location….in cleveland. The building is right on Lake Erie; parts of it actually hang over the water. The same pier also houses a science center, right next door, and the cleveland brows stadium. In Cleveland though? Cleveland isnt the most happening town. Its population has actually been on a steady decline over the past 1/2 century, moving from over 900,000 in the early 1940’s to a little more than 400,000 today. Regardless, the building was immaculate. Why Cleveland? Several other locations were considered; Memphis and NYC being a couple of them. 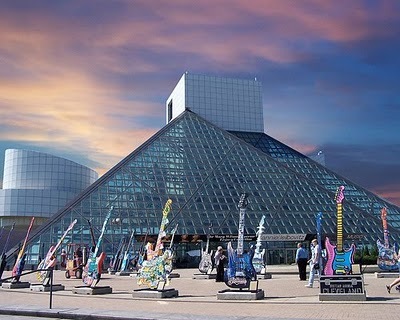 The real reason the Rock Hall landed in Cleveland was most likely the root of all evil today…Money. But, they did also have Alan Freed, the DJ who claimed to coin the phrase, “rock n roll”. In actuality he was not the first to use the phrase; though he did bring it to a larger audience. Plus he organized what is considered the first rock n roll concert, “The Moondog Coronation Ball”, in which they sold 20,000 tickets for the 10,000 capacity Cleveland Arena. Five acts were scheduled that night and they only got through two due to the extra 10,000 concert-goers crashed down the gates and they shut the show down.